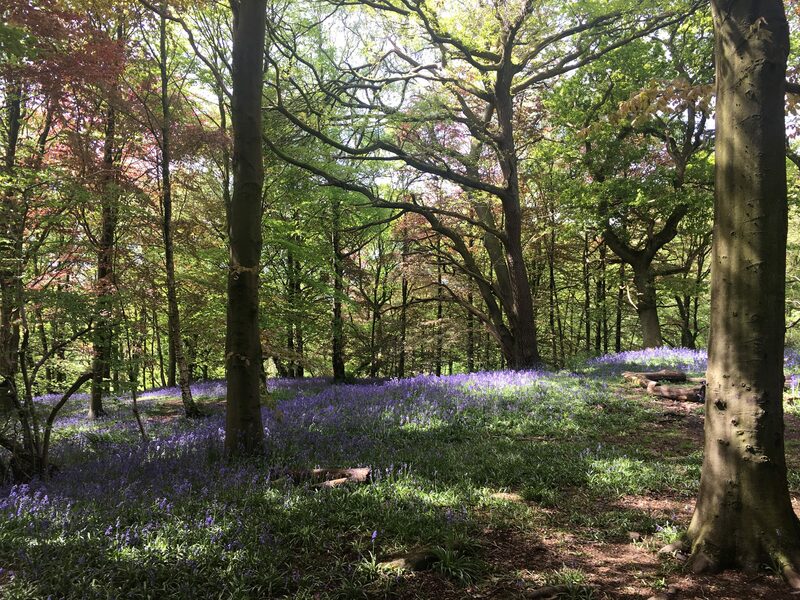 There’s something magical about the blue and purple haze created by the bluebells in the woods. 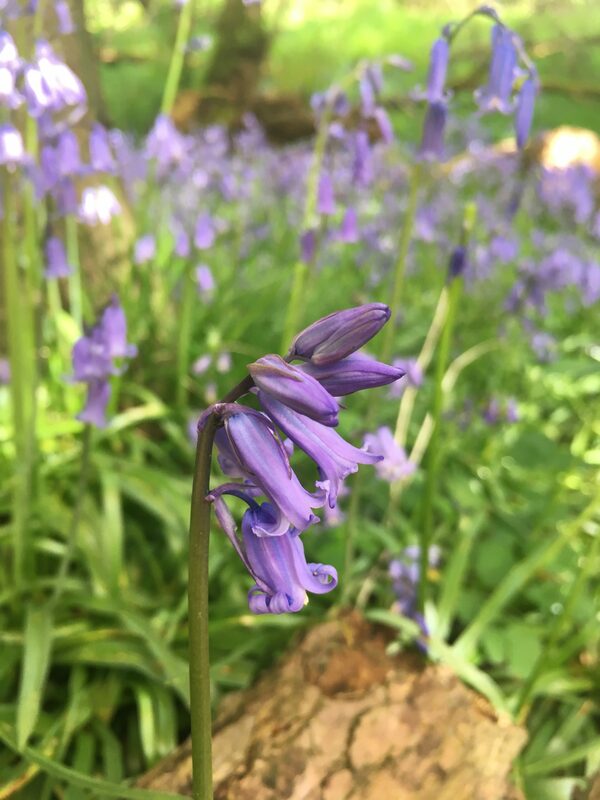 I look forward to them appearing every year, impatiently waiting as it seems “up North’ we have to wait a little longer for our bluebells to bloom. Finally, they are out and this year we made a trip to a wood I’ve been meaning to visit for years, not far from where I grew up, near Ilkley West Yorkshire. 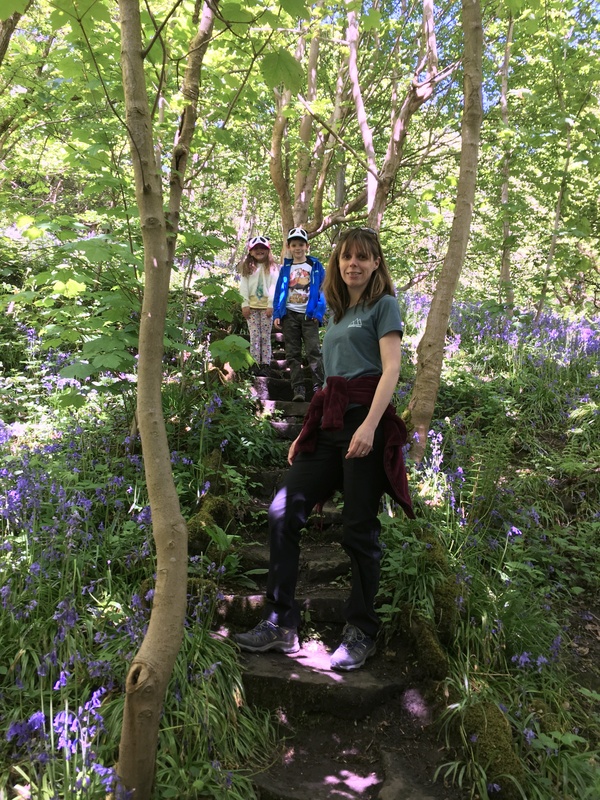 We were headed for Middleton woods, a short walk from Ilkley town centre, to see the stunning display of bluebells that it’s famous for. It was also a chance for me to test out the new Kiwi stretch prolite trousers I had bought from Craghoppers. We parked on the road, near the bridge over the river Wharfe, walking up to Middleton Avenue before turning right on to Curly Hill. You can see the route we took by following this link to the Ordnance Survey map I used. 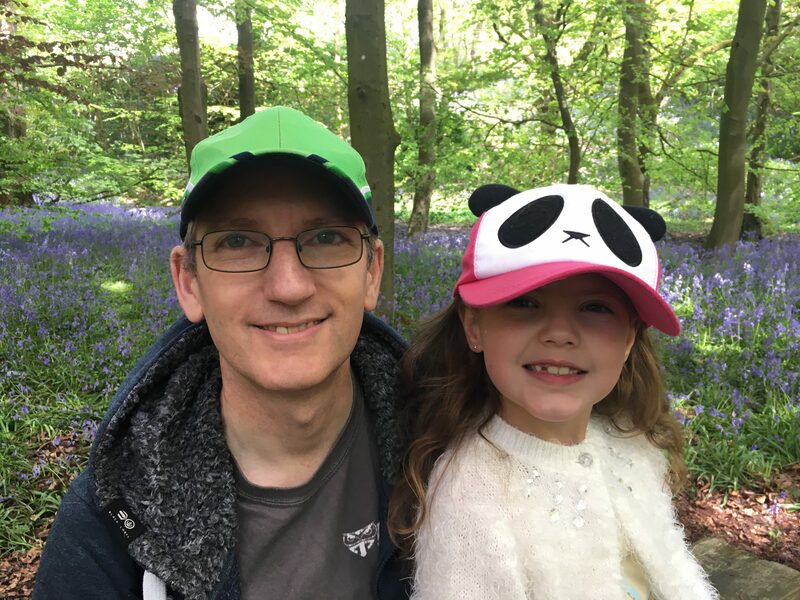 There are a few footpaths through the woods that you can take following the public footpath fingerposts, we were so in awe of the gorgeous houses along this road that we waited till further up the hill before venturing into the woods. The hill climb is certainly good for the legs and the only part of the walk with any steep incline. Once inside the woods we were greeted by the sight I had waited for. Magical bluebells spread out before us. 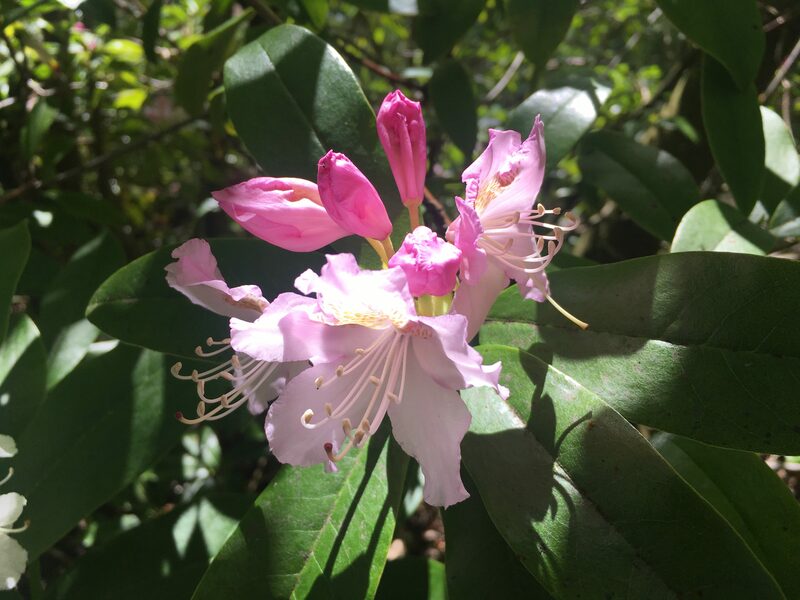 The kids were really excited to explore the woods and were happy to run along the paths, as hubby and I were bended down taking photo after photo of these little delicate flowers. I was getting frustrated at not being able to get the perfect bluebell shot, they never seem as wonderful in my pictures as they did with the naked eye. We had no walk as such planned apart from the visit the woods and see where the paths there took us. 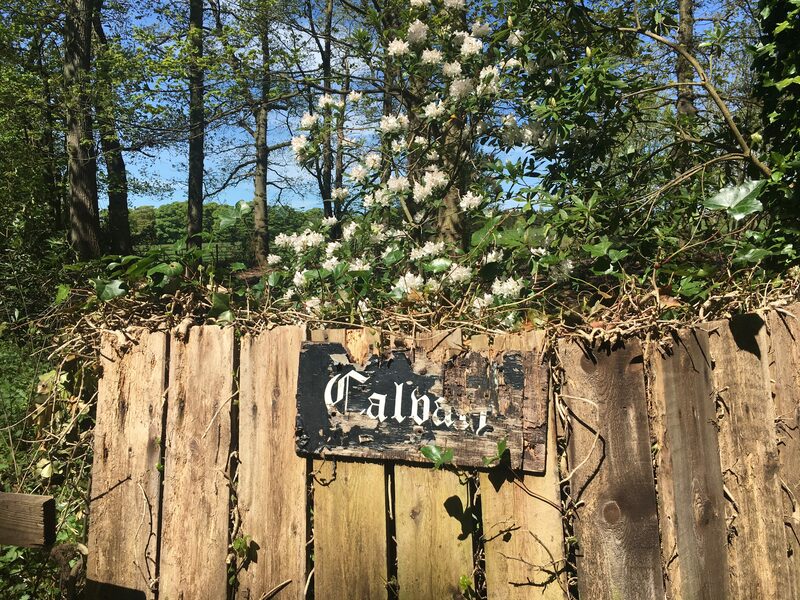 I had read of a nearby folly called Calvary, so we headed in its vague direction. The kids just liked exploring the woods, jumping over small streams, planked walkways and tripping over the many tree roots. It was lovely and peaceful inside the woods, if you ignored my two bickering, and you could be fooled into thinking that maybe this was where fairies might live. Sitting on a bench for a photo, the kids found an old tree trunk that had a hole at its base, clearly evidence of a fairy door and I wasn’t arguing. The path we took headed slightly up hill and to a fence with a stile across a field. Eek! It had inside another of my favourites, Belties! 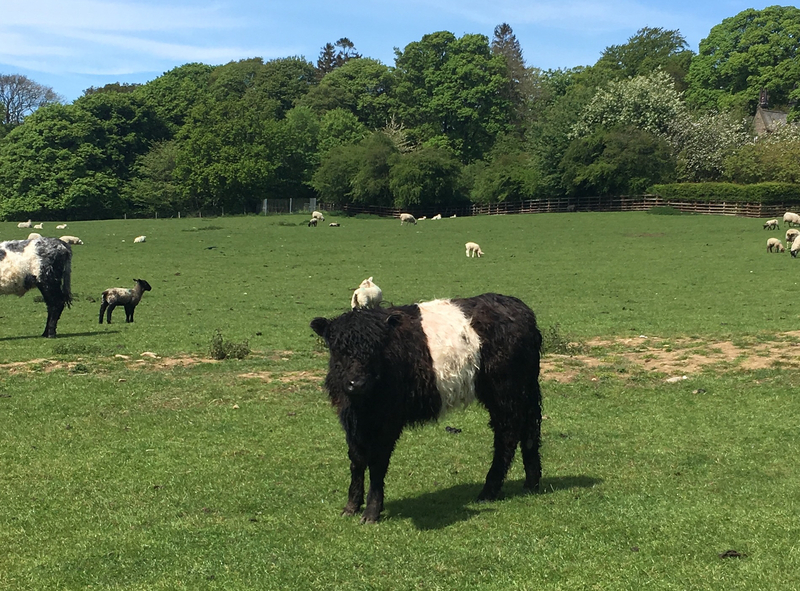 I love belted Galloway cattle, there’s something cute and cuddly looking about them. Not that I would try to cuddle one of course, but I was pleased to see they had some young calves for me to fawn over. Having walked diagonally across the field to another fingerpost sign and navigated a very wobbly stile, we turned left and followed the lane to a junction, before turning right and along the road that took us past the former 16th century monastery at Myddleton lodge. We followed the narrow road that then became a track, leading into more woodland and a public bridleway. 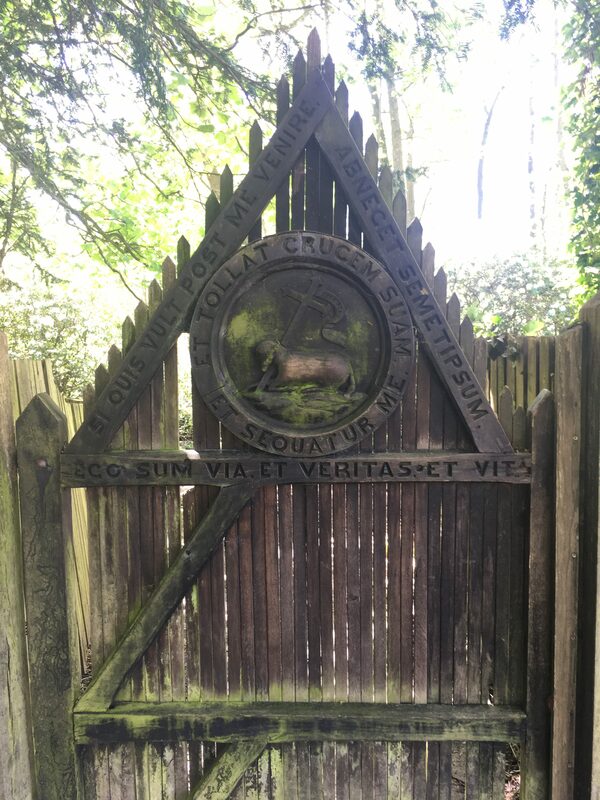 A few metres down this path and there is a wooden door, inscribed with Latin and a wooden sign, suffering its age and the wording ‘Calvary’ just visible. I wasn’t sure what to expect from this folly, the kids were a little put off by its spooky appearance, but we opened the creaking wooden door and stepped into the grounds. It’s a little like a church yard, a path down the middle to a stone structure with ‘altar’ where offerings, candles and crosses have been left. On top of the structure stand three crosses and my son muttered that the building itself was somewhat tomb like. 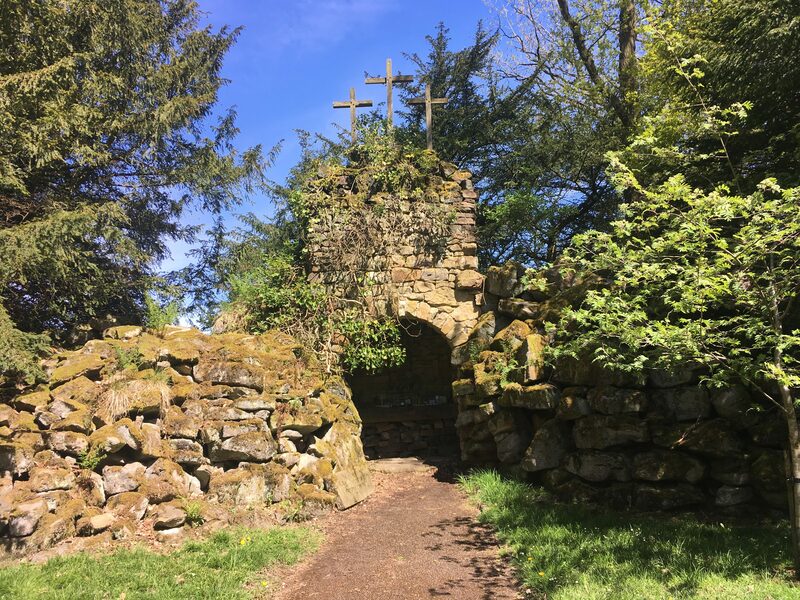 On either side of the path, as you walk down to the folly are religious stone carving telling the story of Jesus’s journey to the cross. I couldn’t find any more information on this place other than it was probably a 19th century folly and probably had something to do with the nearby former monastery. I think it was certainly a place if you were alone in the dark, you could let your imagination run wild. 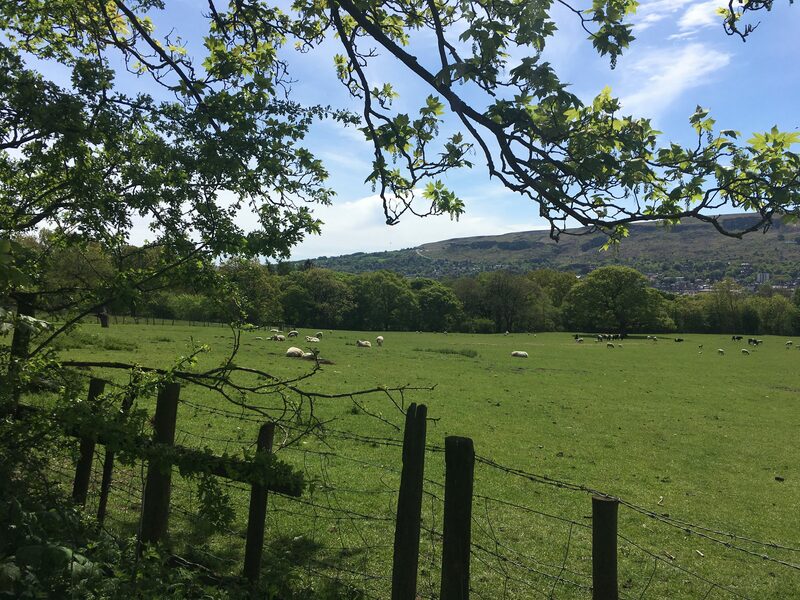 We returned the way we had come, saying goodbye to the Belties in the field enjoying their view of Ilkley moor, and back through the magical bluebell woods. Once back in Ilkley we enjoyed a picnic and ice cream by the side of the river, enjoying the spring sunshine. This walk isn’t suitable for pushchairs. Parking can be a little tricky as on a nice day the roadside parking gets very busy by the river. If you arrive early you can find space on Middleton Avenue, alternatively there is a pay and display car park in Ilkley town centre. Don’t forget money for an ice cream by the river on the way back! There is also a play park with swings if your little ones have any energy left. There are steps down to the playing fields and river on one side which also has a small pebble beach area. People do paddle but only do so with extreme caution as this area is known for very strong currents. 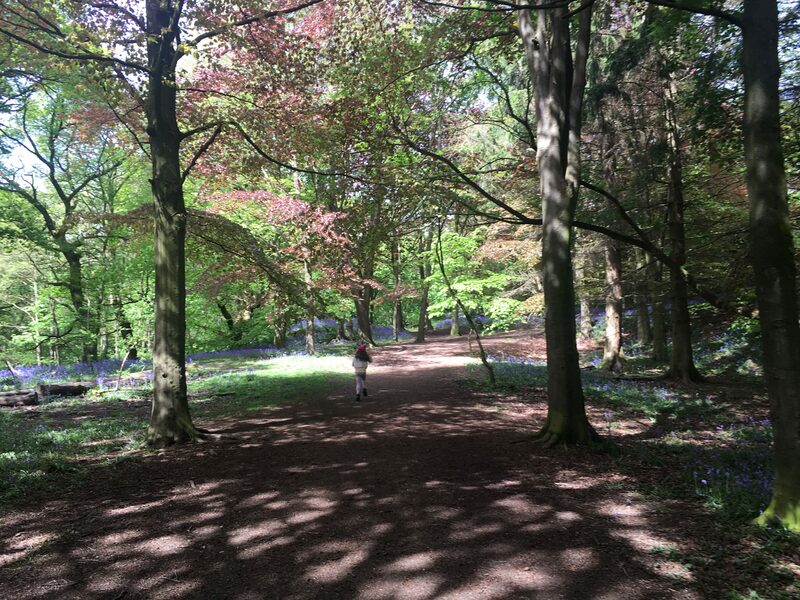 Are there any bluebell woods near you or mysterious follies? Let me know in the comments. For more chat and photos come say hi on my Facebook page. Such a lovely walk, this! We don’t have any bluebell woods where we live, but our garden is full of them. Oh how lovely, I would love bluebells in my garden! Thanks for reading. You would have giggled more if you’d seen me posing trying to get the 10-year-old and hubby to take some pictures of the trousers! Thanks for reading. The bluebells never last long enough do they?! Thanks for reading. Ooo lovely. They are so beautiful, but sadly don’t last long to enjoy them for long! 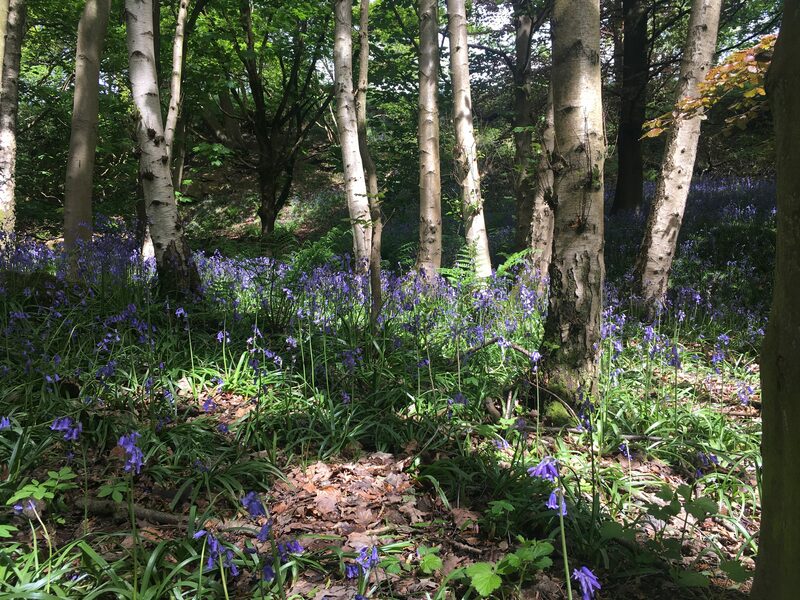 I do love a bluebell wood. There is just something so magical about that blueish haze on a woodland floor. They are a magical flower aren’t they? thanks for reading. Ooo sounds lovely, I wish they were around longer for us to enjoy. Thank you! 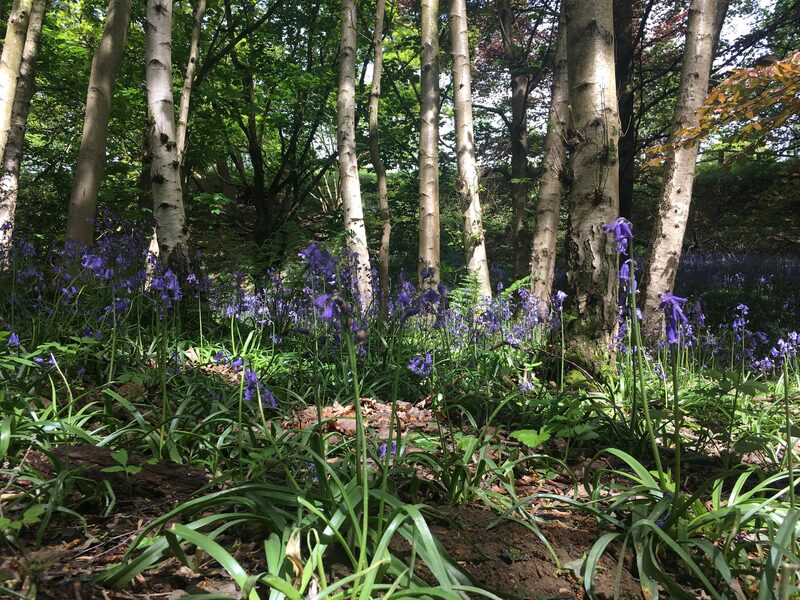 It sounds a beautiful place to enjoy the bluebells. 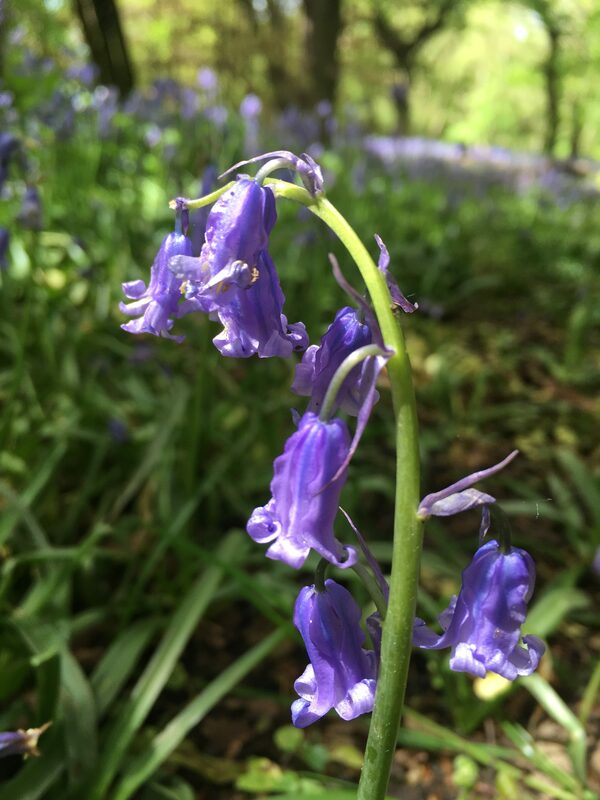 I share your frustration with taking the perfect bluebell photo, they are much harder than you think! Yours look beautiful and the whole walk sounds a lovely adventure. The folly sounds full of intrigue and with quite a history behind it. the trek looks so pretty and good advise about pushchairs. Thanks Fiona. I think the bluebells need to hang around a bit longer for me to perfect my shot! They disappear far too quickly but I suppose that’s the magic of them. Wish I could find out more about the folly, partially because it’s such a secret! Thanks for reading. I quite like the mystery surrounding Calvary, but I’d love to know more about it. Thanks for popping by!